Kenko is upgrading its teleconverters with its new HD Pro range. Replacing the previous PRO300, the new converters have been redesigned optics and multi-layer coatings, to match contemporary high-resolution DSLR cameras and lenses. Teleconverters are designed to fit between the lens and the camera body – increasing the focal lenthg of the lens being used. The Teleplus HD Pro 2x DGX is acts as a double – increasing the focal length of compatible lenses by a factor of two. So that a 70-200mm becomes a 140-400mm, for instance. Weighing 180g, this accessory has a depth of 40mm – and will go on sale for a recommended price of £269, in a choice of Canon EF or Nikon F mounts. It is constructed of 7 elements in 5 groups. As usual for a 2x converter this will give a two-stop reduction in the maximum aperture of the lens. The Teleplus HD Pro 1.4x DGX meanwhile extends the focal length by a factor of 1.4 times... so that a 200-200mm becomes approximately a 100-280mm. This converter has a depth of 20mm, weights 128g. Constructed from five elements thin four groups, it has a price of price of £219, with both Nikon F and Canon EF options. The 1.4x converter, as usual, reduces the maximum working of the aperture by one stop. Optical construction has been redesigned by implementing additional optical elements and improved multi-layer, anti-reflection coatings. The external design has been re-finished in a black leather tone to perfectly match with the latest lenses and DSLR cameras. The teleconverters have electrical contacts to maintain communication between the camera and the lens. 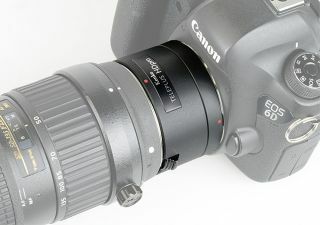 The focal length and aperture values are recorded in image EXIF data and converted to the actual shooting values with the teleconverter attached. As with all teleconverters, they are not suitable for all lens and cameras. You should check compatibility for a particular lens/camera combinations on the Kenko webpage.